My love for Sandbridge Beach started back in the late 1980’s when my boyfriend, now husband, would take me down to Little Island Pier at the south end of Sandbridge Beach. Sandbridge Beach stretches five miles along the Atlantic Ocean. Its pristine sand dunes, beach areas, and dancing sea oats capture your senses and truly make you slow down. There we would meet up with his friends during summer break so they could surf. I remember the drive – little winding two lane roads surrounded by deep ditches filled with brackish water and tall seagrasses. Farm land was undeveloped and you could see cornfields for miles, and yes, there was one traffic light! Eventually we’d roll-up to the old life guard house and pier at what seemed to be the end of world – Little Island Park. There was a sand-parking lot, very rustic public restrooms and a couple of tennis courts; they get really hot on sunny summer days, so bring your racquet and your shoes! 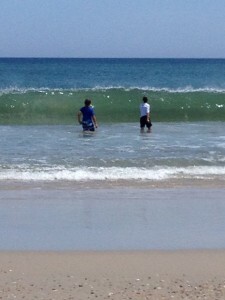 The guys would surf for hours and I would soak in the sun. We lived the life, Virginia Beach style. Sandbridge Beach had beach homes and cottages – but not like the homes that stand there today. Back in the day, most of the cottages were rentals or second homes with a small community of year-rounders. Today, those numbers have nicely balanced out. Sandbridge Beach is no longer the remote south beach of Virginia Beach. Sandbridge is a bustling community with many full-time/year-round residents. There are kids of all ages and homeowners of all ages too. Small business owners, doctors, lawyers, teachers, members of the military, accountants, surf board designers, fishermen, real estate agents, therapists, fireman, rescue squad volunteers and more, that live, work and thrive, year-round in Sandbridge. Fortunately for Sandbridge, Americans still desired family vacations even during the economic downturn. And their love for the casual beach lifestyle keeps them coming back! Sandbridge was able to weather the economic storm due to the fact that it offers a remote getaway, yet vacationers are able to access it quickly and easily while not being too far from their home bases. Sandbridge is not too far off the beaten path, so access to interstates is relatively quick (approximately 13 miles). Norfolk International Airport is about 25 miles from Sandbridge Beach – a stone’s throw away. Those that know Sandbridge want vacations where families can come and gather together – the more the merrier! Having access to amenities and being able to stay connected to the world is important, if needed. Today you will find restaurants, grocery stores, ice cream shops, breakfast eateries, and even condominiums at both the south and north ends of the beach – Sandbridge has it all these days – including a well-balanced housing market. The Sandbridge housing market has remained strong – sure it felt the pain and heartache of the economic downturn – but that pain was short-lived. Due to the fact that there is a strong balance between full-time resident homeowners and second home/vacation home owners, property values stabilized before other areas of Virginia Beach and revitalization of old homes and new home construction has been strong. The median homes sales price for 2014 is $659,000 and goes upwards of $1,400,000. Presently there are 29 homes for sale on the market and over the last six month 9 homes have gone pending or have sold. There are approximately 38 monthly rentals on the market and rents can run from $1,150 per month to $12,000 per month. There are even more weekly rental options in Sandbrdige. Because the housing market is strong and thriving in Sandbridge, the need for casual, good food & dining has continued to flourish. If you know Sandbridge, you know Baja! A few other locally owned great eateries are BoardWok, Flip Flops, Blue Pete’s (which is technically in Pungo, but you’ll make time to go), Zest, Back Bay Gourmet, Sandbridge Island Restaurant, Seacrest, and of course we cannot leave out Margie & Rays Crabhouse – best She Crab soup in the area, in my humble opinion. Red Mill Commons is a short drive from Sandbridge and has everything from Target, Home Depot, TJMaxx, Pier- One Imports, Walmart, restaurants galore, jewelry stores, salons, bike stores and more. Sandbridge is an amazing beach community. The City of Virginia Beach has built two public parking lots with restrooms and bath-houses. For a small parking fee, locals can visit Sandbridge daily. Little Island Park even has a large public picnic area and a state-of-the-art playground for the little groms. There are events all year round for residents and vacationers to attend. Backed by a strong civic league, the community has a voice that stays involved in communicating to homeowners everything from the Federal Government Sand Replenishment Program to ensuring that the 4th of July Fireworks events go off without a hitch to kick-off the summer. Attend the annual Flyway Fest, participate in the Little Island Park Fall Beach clean-up events, surf in the annual Baja Surf Classic Competition, run in the LiveStrong Sandbridge Dolphin Challenge 5k & 10K races, take a surf lesson through Sandbridge Surf & Adventure Company or have them set you up with a SUP (stand up paddleboard) to hit the Back Bay w/ a paddle board tour, and ride with your group on a tram tour with the Back Bay Restoration Foundation through the Back Bay Wildlife Refuge. No matter what your fancy, in the end, we want to gather with our friends and family where we can dig our toes in the sand, ride the waves, enjoy the camaraderie of Sandbridge and benefit from an active community. If you are contemplating investing in a residence in Coastal Virginia, Sandbridge Beach truly has it all. The professionals at Virginia Coastal Connection will help Guide Your Next Move!